Tomorrow's News Today - Atlanta: A Look Back at Old Hickory House . A Look Back at Old Hickory House . Dunwoody recently witnessed the closure of one of the oldest restaurants in metro Atlanta. Old Hickory House on Chamblee-Dunwoody Road had been a landmark for decades but abruptly closed about a week ago. 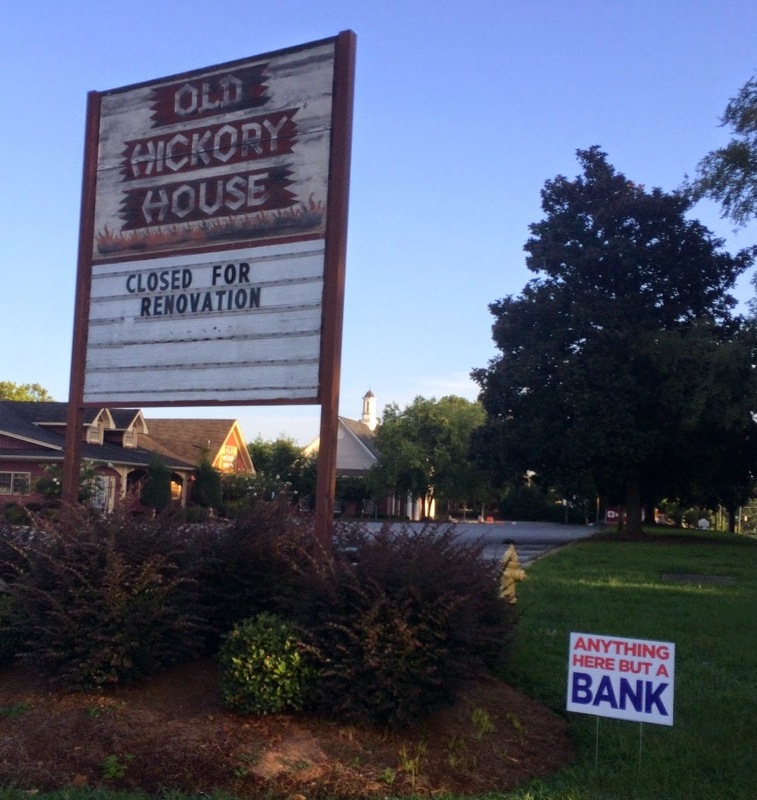 The restaurant, which served breakfast, lunch and dinner, posted a sign saying it was closed temporarily "for renovations," but sources at Old Hickory House in Tucker indicate the closure is permanent. The parcel the restaurant sits on offers great visibility and is close to many desirable neighborhoods. Given the issues Chick-fil-A experienced in their attempts to open in Dunwoody Village, (they eventually opened in a retrofitted Arby's nearby), I doubt very much a fast food restaurant would try to open. It's quite possible that a restaurant, or anything other than a bank, opens, but regardless, the building will likely be demolished. Since the Dunwoody closure leaves metro Atlanta with just one Old Hickory House, I wanted to take moment, as I've previously done with Blockbuster Video and Donatos, to reflect upon their former locations. William and Frances Black founded the company in 1953, and at its height, operated approximately 20 locations in at least three southern states. Additionally, Old Hickory House had a corporate office on Piedmont Road in Buckhead, and a commissary in Doraville. The Black's children later ran the family business with T. Jack Black and his first wife Ann playing integral roles in the company. T. Jack was heavily involved in the 80s and 90s, but had taken a step back lately, given his age. Ann owned the Dunwoody location, and her brother-in-law George Jackson operates the Tucker restaurant, according to an employee in Tucker. I'm too young to remember all of these, but my research indicates Old Hickory House had a number of great locations. Please find below metro Atlanta's former places to "put some south in your mouth." 2915 Piedmont Road (corporate offices) within an existing office park. 5490 Chamblee-Dunwoody Road (Dunwoody) Closed as of last week. 3579 Memorial Drive (Decatur) - Most recently home to "China Cafeteria"
5611 Memorial Drive (Stone Mountain) - Most recently home to "The Bridge Cafe"
1600 Piedmont Avenue (Midtown) - Today home to Cowtippers Steaks & Spirits. 1479 Scott Boulevard (Decatur) - According to The Atlanta Time Machine, this location has always served BBQ. In the early 1950s the restaurant was known as Old Hickory Inn. A few years later it became the Old Hickory House and stayed that way until the 1990s. The restaurant later became Big Greg's Barbecue, which lasted a few years. Following that, it was re-opened as Rockin' Rob's, another barbecue restaurant. Rockin' Rob's lasted for a couple of years or so and was later replaced by Maddy's, another barbecue restaurant. Maddy's closed a few years ago. In early 2012, Fox Bros Rib Joint announced they were going to open a new restaurant in the Maddy's space, but later abandoned their plans. In late 2012, 101 Concepts planned to open their Meehan's Public House concept at the old Maddy's, but they too later called off their plans. Today, the restaurant is vacant. 6420 Roswell Road (Sandy Springs) - Today the land is home to adult entertainment venue Flashers. 424 Forest Parkway (Forest Park) - Today the site sits vacant with the restaurant having been demolished many years ago. 2834 Washington Road and 3026 Washington Road (Augusta) Old Hickory House reportedly moved from one location to the next. Their first location is today a Hooters, while their second location is a Denny's. 2202 Northlake Parkway (Tucker) - Today this location is the last remaining of the chain. 6538 North Tryon Street - Despite a fire this past February, this Old Hickory House is still open and still popular, according to locals. An original Charlotte location reportedly opened in 1957 on Freedom Drive with the current location having replaced it in 1972. The Old Hickory House in Charlotte was never owned by T. Jack or Ann although their father William did assist in getting it up and running. The Charlotte location was kept in the family though with brothers Bobby and Gene Carter, cousins of William, operating the restaurant. Today Bobby and Gene's sons, Kevin and David, run the restaurant. There were also reportedly locations in Athens, Tallahassee, and Chattanooga but despite my best efforts, I was unable to confirm when or where they were located. Please share your Old Hickory House memories in the comment section below. I was always a fan of the breakfast at Old Hickory House, especially the biscuits. Lots of good memories with the family and it always seemed packed for breakfast on the weekend. Great piece, thanks. Fond memories of the Scott Boulevard location as a kid in the '60s. Great brunswick stew -- and one of the first places I ever saw those little jukeboxes at each booth. I grew up near the Buford Hwy location. The hams were finished off just a few feet behind the people taking orders on an open pit. My dad always ordered the 'outside pork' sandwich. Nothing but Bark! On Northside drive, just a tad north of GT, is/was an Oga's and I think it used to be an OHH (based on reading ATM). Some may recall that the old Forest Park location was the bus stop scene in "Smoky in the Bandit" filmed circa 1978. The scene had Jacky Gleason and Burt Reynolds in their first face to face meeting followed by Sheriff Buford T. Justice leaving the from door with toilet tissue still attached to his pocket and where he says "thank you nice lady". I grew up in the Northlake area and went to that location many times, usually with my dad, who liked to treat us. (Short stakes for the littles - that's what we all got). Now I like the biscuits and gravy, and somehow I've never eaten anything on the lunch/dinner menus. I hope the Northlake location can last at least a little longer. Very fond memories. Been going to the Dunwoody location for @ 15 years. Always enjoyed their BBQ sandwiches. Sad to see them go. Have never liked the Northlake location. Didn't know they had such a history. Great article!! There was also one in the Days Inn at Roswell Road and I-285, just inside the perimeter. Site has been demolished and still sitting empty. Thanks for the post. Interesting stuff. I grew up in Dunwoody and had many a meal at HH after little league, boyscouts and the like. Good memories for sure. Anonymous at 2.34 pm is incorrect. "Put some south in your mouth" has been Old Hickory House's slogan for decades, and was sung in the TV jingles that everybody who lived here in the early '80s remembers. The "lobby of the Days Inn" location in Sandy Springs was the last one to shutter prior to Dunwoody. I believe that it closed around 2002. Was there one in Douglasville also? Bye Hickory House Dunwoody. Will miss you. Totally agree with Grant Goggans about the comments from poster at 2:34pm. I've eaten at both and if Old South indeed says that......they " borrowed " that from OHH. Was a resident of Dunwoody for over 10 years. OHH was a traditional meeting place, usually for breakfast at least weekly, with my best friends there. I have always looked forward to meeting there in Dunwoody when I revisit Atlana. The atmosphere nutured many good times. The passing of the Old Hickory House is sad for me, indeed. DO YOUR HOMEWORK - Ann was Jack's 1st wife and does not own Dunwoody. Yes, Northside Dr at NE corner of Deering. Our family at there many times in the 60's, even had them cater several events for us. Dont' think it was made clear, but the Piedmont Rd location, now Cowtippers, was a restaurant and the corp offices (if it's the same address). Best Brunswick stew ever. Lived in Dunwoody for almost 20 years and ate many a great meal at OHH. The closing makes me miss Dunwoody much less. The BEST Brunswick stew ever. Starting working at OHH on Memorial Drive across from the old Avondale mall right after turning 14 (1973 - 80 cents an hour!). Worked for JR for a few years. Never tasted better BBQ and never had as much fun working as I did there, but learned a great work ethic from those folks. Sorry to see them go by the wayside. If there was an Oga's on Northside, it must have closed at least a decade ago, probably quite a bit longer. It must have been decadeS ago. Now that Cardamom Hill is gone, with the exception of maybe that condo development on 10th street, I don't think there's even ONE non-fastfood restaurant the entire length of Northside Drive between Paces Ferry in Buckhead and Castleberry Hill, by the Georgia Dome! Indeed if you drive by the place where there was an Oga's during the JFK administration, there's no trace of any sort of dining establishment being at that location. There is a shuttered Mexican place near 17th but that always looked very sketchy. I grew up at the Hickory House on Piedmont. we went there as a family all the time. My mother also got her pork outside cut. But as a kid, the inly thing I would eat on the menu was a chick FIL A sand which. At that time it was the only place I knew that had them. One of my most important family memories. The Augusta restaurant was in three different buildings - it originally was in a spot further down Washington Road in front of the Publix at Alexander Drive that is now a Mexican retaurant. The current Hooters was a large building and very nice. It went downhill after it moved into the Days Inn. As mentioned above, the one in Forest Park was used in the 1977 movie "Smokey and the Bandit". Sheriff Justice (Jackie Gleason) orders a "Diablo sandwich" and a Dr Pepper. There was also a location on Candler Road in S.Dekalb. I worked there as a teenager. It was owned by George Jackson who also owns the Tucker location. I don't remember a location in Athens. I was here in the mid to late 70s and this was Poss Country when it cane to barbeque. There may have been one opened in the 80s. I'll see what I can find out from the "old Athens" group on Facebook. I have lived in the Atlanta area my whole life. I have nothing but good memories eating at different Old Hickory House restaurants. I still eat there every week. I asked George to open one in McDonough where I live. He said been there done that. I hope Old Hickory North lake never closes. Used to go to northside drive location in mid '50's while in school at GT, not sure but think it was the original location for OHH. during FB season we would go there and drink beer before a game at grant field, left atlanta after tech and came back many years later for first time and they were every where. I expect that family made a lot of money out of the real estate over the years. Yes. The earlier commenter was correct. There was a Hickory House location on Northside Drive at Deering Road before it was an "Oga's" or whatever. The lot is now cleared on that corner. Back in the 60's through eighties I frequented the Buckhead store, the Midtown Piedmont restaurant, and the one on Northside Drive. Also I think there was one out past 285 near where Spring Road comes into 41 that we used to go to i the eighties. I did not know there were any still open. They had a good menu, consistency and a following. I remember wondering why they disappeared. I recall hearing there was some alleged poor management unrelated to the viability and profitability of the operations. I just had a ribeye steak for dinner. It was so good. First ribeye steak I ever had was at the Old Hickory House in Dunwoody. That was 35 years ago. From then on, every business trip to Atlanta had to include at least one meal at the the Old Hickory House. The ribeye tonight reminded me of that restaurant which prompted a Google search and brought me here. Sad to hear it and all the others are gone. Memories! My first part time job as a teenager was at the Northlake location in 1978. Started out as a busboy, moved to a dishwasher (the water from the Hobart was nuclear hot). I got to pull the boiled chicken apart for the Hickory Chick sandwiches, work the garlic bread station in the kitchen then I hit the big time: working the take out counter. Buddy Buie, the manager and producer of Atlanta Rhythm Section, placed a to go order and tipped me a dollar. The only tip I ever got! I still have a scar on my big toe where scalding water from a chicken pot sloshed out and went right through my Sears athletic shoes. Mother's Day 1978, an unbelievably busy lunch time, I was carrying a huge stack of plates from the dishwasher to the pass through area for the kitchen and just as the owner, Jerry Romano, walked into the dish room, I dropped them. Must have been 40 plates. I'll never forget his loud plaid sportcoat and the look on his face!! "424 Forest Parkway (Forest Park) - Today the site sits vacant with the restaurant having been demolished many years ago." ...place it somewhere nearer to 175 Main St. Forest Park, GA 30297 ? I moved to Atlanta in 1969 and bought a house on Deering Road and soon discovered the OHH at the intersection of Deering Road and Northside Drive, but couldn't remember the through street it connected with until someone above me said it was Northside. I lived there until 1980 and of all places I ate out, OHH at this location was top on the list of wherever I went out to eat. Even though I'll soon be 81, I can easily handle my 3 hour drive to get back. An Atlanta buddy of mine told me that all of the OHH had closed, but it's good to know that's not the case and I'll find one of them the next time I'm in, as my employer, Mayor Ivan Allen said, "This City is Too Busy To Hate." I was told the owner married into the HH family and obtained the Brunswick stew receipe. It's a match ! I actually managed the pharr road location in the early 80s. I did most of the catering for the company as well. you cant find bbq or stew anywhere on the planet that compares to ohh. I worked at the Commissary in Doraville around 1974. My Aunt (Ruth Britt) was a waitress at the Piedmont Ave. location (I believe that is the one). She always worked breakfast/Lunch shift and was there for well over 20 years. She had to quit around 1986, she had diabetes and lost her leg from complications. I remember the manager or maybe the owner tried to get her to stay, they were perfectly willing to do some "adjustments" to her "section" so that she could continue to work. It broke her heart to leave. I can easily remember the pit master (I wish I could remember his name..Mr. Charles maybe??) ALWAYS sent ribs and Brunswick stew home with Aunt Ruth when he knew I was visiting. My favorite picture of Aunt Ruth was when she was wearing that patchwork apron and had (I believe it was) antlers on her head for Christmas. Whichever location she was at was close to the OMNI. The WCW wrestlers would come in after practicing and would always sit in her section. I miss my Aunt and I would pay A LOT of money for some OHH Brunswick Stew!! Is it my imagination or did some or all OHH restaurants serve Chick-fil-A sandwiches? I seem to recall getting some at the Decatur location, perhaps late 60s or early 70s. Is my memory correct? Is it my imagination or did OHH serve Chick-fil-A sandwiches back in the late 60s/early 70s? Seem to recall them at Decatur location. Or is my memory faulty? When I was 15 years old I got my second job as a dishwasher at Old Hickory House on Memorial Drive in Stone Mountain. (Working with then waitress Joan Puls and Richard Seastrom) After excellent performance, I was promoted to busboy. And when an opportunity to be a cook opened up, I took control and started my journey developing my culinary love now known as tommygrill. (I was a shoe in for the dishwasher position because my first job was washing dishes at House of Li chinese restaurant on Memorial Drive on Friday and Saturday nights for $13 per night at age 14.) Jeff Chance's stepfather Lou Prolego was my manager and he was a fantastic man! I grew up in Augusta,GA. The Old Hickory House in Washington Rd was a solid go to for breakfast and lunch. (I'd mention dinner, but I was expected home at that age! So, Bill Waite was owner of the Augusta OHH. Fast fwd...I moved to Atlanta (1987). Around the corner, I quickly learned that Oga's on Northside was the original OHH location.By the time I stepped foot in Oga's...the building was clearly doomed and failing...but until the end...the owners stayed true to some of the OHH offerings..certainly the chicken sandwich. Today, there is nothing on the property. There is only one OHH left. Tucker, GA. If I had my way, I'd help start a new appreciation of a perfectly Southern restaurant concept that should still be an integral part of the fabric of our Southern roots. I didn't work there but ate there often and knew some of the waitresses. Do you remember any of their names? They were awesome. I knew several people who worked there and I know JR was a wonderful boss. I knew him & Cindy. Did you know of a manager named wayne almand? I have the utmost respect for Jack Black. I remember years ago we had one of Atlanta's famous ice storms and we were iced in for about a week. Most of Atlanta was without power. Jack Black opened his restaurant on Northside Drive (maybe others also) and fed the Georgia Power workers trying to restore power. He did not charge them. That is the kind of man he was. Hudson's had nothing to do with Old Hickory House. The receipt s totally different and has been owned by Buford Hudson for years. There was never o e in Douglas County. There was a Sonnys where the Folks currently is. Jerry romano, hence JRs.HE was the manager of memorial drive in the 60sor70s. Already knew the recipe as most managers were family. The original location of the Forest Park OHH restaurant was @ or near 175 Main st, right where the intersection of Main St (back in the day) as you headed north towards Mountain View and Hapeville, merged with Old Dixie Hwy. Sometime after the Smokey and the Bandit movie was made, early 1980's IIRC, the restaurant closed and moved to the 424 Forest Parkway location about a mile or so away. This article also omits many more locations, several of which were located on the Southside of Atlanta. There was one on Stewart Ave/Metropolitan pkwy 2 driveways South of the intersection with Cleveland Ave, next to the gas station on the SW corner of intersection, and I seem to remember another on Campbellton Rd fairly close to Greenbriar Mall.